Size: 406 sq.ft. - 928 sq.ft. Dusit Princess is a joint venture between Rijas Aces Property & Dusit Hotels & Resorts. 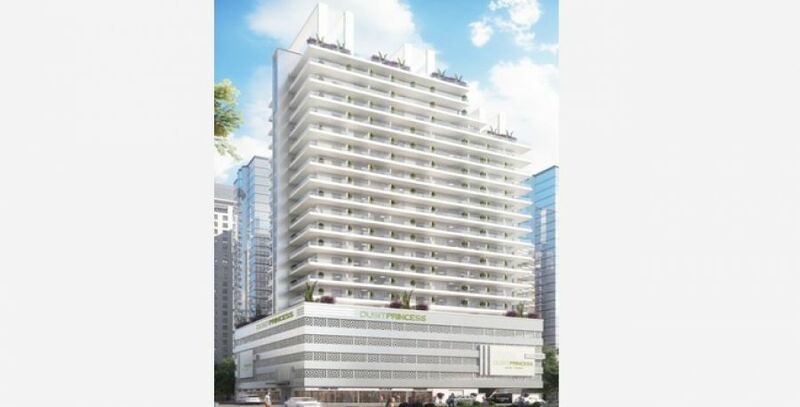 Dusit Princess is a hotel apartment project in Jumeirah Village Circle will be operated under the Dusit Hotels & Resorts brand for its technical interior. It's an ongoing project and it is the sixth property by Dusit Hotels & Resorts in the UAE promises to deliver elegant apartments. This newest construction sits over 288460 Sq.ft of area where the total saleable unit area will be 166940 Sq.ft. It will offer you complete luxurious hotel experience comes with easy payment plan on offer where 5% is as down payment, 5% within 30 days from the booking date, 10% within 180 days from booking date, 10% within 1 year from the date of purchase, 10% on completion of 4th podium’s pouring, 10% on completion of 4th floor's pouring and 50% during handover date. The possession is expected by December 2019. The building of the project is proposed with Ground floor + 5 Podium Levels + 17 residential floors + Rooftop. Dusit Princess Aces Dubai will accommodate more than 250 apartments hosting the choices of Studio apartments, 1 BR, 2 BR & 3 BR Penthouses. These opulent hotel serviced homes start from the price of AED 487,000 with area ranging between 408 Sq.ft to 930 Sq.ft for Studio, 1 BR & 2 BR apartments. These 4 star hotel apartments are designed with the very latest high-tech features. Its king sized city life is giving Dubai & International clients to drive down for this big city of Dubai. Jumeirah Village Circle is located in the heart of New Dubai facilitated with all modern settings developed by Nakheel Developers. The development of Jumeirah Village Circle broad range of houses near to the exciting places like Palm Jumeirah, Jebel Ali Racecourse, Dubai Meydan Racecourse, The Els Club Golf Course, Dubai Mall, Nakheel Mall, Mall of the Emirates, EXPO 2020, Global Village, Dubai International Cricket Stadium, Burj Al Arab, Dubai Internet City, Dubai Polo & Equestrain Club, Dubai Silicon Oasis, Dubai Marina, Burj Khalifa, Dubai Festival City, Dubai International Airport, Al Maktoum International Airport. Let yourself to be part of the neighbourhood projects - Belgravia by Ellington, Tilal Al Ghaf by Majid Al Futtaim, Eaton Place by Ellington and ASEEL Villas by Emaar Properties. Ducit Princess Rijas has 6 entering & exiting ways lies in the adjacent to main roads E44, E311 & D61. ACES Property is one of the renowned Dubai Based development firms. They have over 1 million square feet of projects which are under construction stage that includes the portfolio of mixed use projects, residential projects and commercial projects. The sales network of the firm reaches beyond the UAE into major investment markets such as Russia, North America and The Indian Subcontinent. Very soon the ACES Developers will deliver hotel apartment development in JVC, Dubai. The company has signed an agreement with Dusit Hotels & Resorts to bring this brand in Dubai, UAE. Dusit International holds experience of 65 years in the hotel and hospitality industry. This hotel & hospitality brand compromises of four hotel projects named DusitD2, Dusit Devarana, Dusit Thani & Dusit Princess. Dusit International has 29 properties in China, USA, Maldives, Kenya, Egypt, Thailand, UAE, India & Philippines. Rijas Dusit Princess is an extraordinary fusion of fully hotel serviced apartments hosted with Fully Equipped Gymnasium, Swimming pool, Thai Bistro, Spa, Sauna, Jacuzzi, Play Area of Kids, Designer Retail stores, Outdoor Café, Fully furnished apartments, 360 degree views of sea, Restaurants, Visitors Parking etc. 406 sq.ft. - 928 sq.ft. 397 sq.ft. - 1350 sq.ft.